Business is booming – quite literally – for Mass.-based O.C. White. The company manufactures a range of industry-specific lighting and mechanical products with one thing in common: adjustable boom arms. Otis Charles White, a small-town dentist founded his eponymous company in 1894 with his pioneering design for a gas-fueled adjustable dental light. The company’s adjustable magnification and lighting products are ubiquitous in many disciplines and areas of manufacturing including medical, photographic, quality control, critical safety inspection, microscope lighting and electronic magnification. 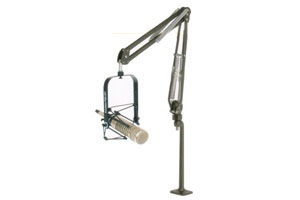 Microphone boom arms are a natural extension of the company’s industrial reach, so it should be no surprise that O.C. White has been successful in the broadcast industry as well. For this review, O.C. White provided a ProBoom Elite 61900-BG arm that features two spring-loaded adjustable segments and a fixed base/riser. The riser/base is a 15-inch vertical metal tube that has a rectangular 3-inch by 2-3/4-inch base that permits either through-the-counter wiring or side exit. Four screw holes are provided for attaching the base to the target surface. The riser comes prewired with a Gepco 24-AWG microphone cable that terminates in a female XLR jack near the top of the riser. A nonterminated four-foot length of the cable extends from the riser base for attaching to a connector or patch bay or other existing audio system. For more information contact the company in Massachusetts at (413) 289-1751 or visit www.ocwhite.com. A 40-inch XLR cable is required to get the signal from the microphone to the female XLR jack at the top of the desk-mount riser. A removable plastic strip hides the wire channel running down the spine of each segment. This strip permits quick and easy installation of the user’s microphone wire. Simply drop the wire in place and zip the wire covers in place. The two-segment spring-loaded boom arm attaches to the riser via a heavy-duty swivel socket. Each arm segment measures 18 inches and features two soft gold-plated “music wire springs.” O.C. White states that the ProBoom arm can hold up to eight pounds when used with the optional heavy-duty springs. Mounting the riser and boom assembly to my desktop using appropriately sized wood screws was quick and straightforward. But it did not take long for me to realize that the corollary to a heavy-duty boom arm design that holds up to eight pounds is that a greater amount of force is required to move the arm, especially at the joint just above the riser. This force, in turn, transfers to the spot where the base attaches to the desk. The screw holes already showed signs of loosening. I removed the screws, drilled clear through the solid oak surface and switched to the widest bolts that would fit through the base holes, fastened on the underside with nuts and large diameter washers. The heavy-duty arm now had appropriately heavy-duty mounting – desk and mic arm were now evenly matched. Although this experience should probably be considered “operator error,” I relay it as a warning to all who intend to mount this arm on fiberboard-based counters or thin wood surfaces. Properly mounted, the arm functions with excellent sturdiness that does not stray from its designated position (a continual annoyance endemic to cheaply built spring arms). The well-matched soft gold-plated springs generally are quiet, as advertised, providing a professional on-air performance. Normally, care should be taken in making sure the springs have not migrated toward contact with the arm assembly over time – metal against metal does not a quiet arm make. The ProBoom, however, has integrated slots in the spring holders that is claimed to prevent the springs from moving from their original position. As in other industries, O.C. White’s broadcast microphone arms are a success story. With proper mounting and minimal care, this mic arm should withstand many years of continuous, high-traffic studio use. To wit, O.C. White backs its product with a lifetime warranty.